“What if?” questions have always stimulated people to think in new ways. What if the Earth Had Two Moons leads us on a fascinating 10 world journey exploring what the Earth would be like if conditions in the universe were slightly different. The answer: Earth would be different, often in ways that would surprise us. The title chapter, for example, gives us a second moon orbiting closer to Earth than the one we have now. The night sky is a lot brighter, but not forever. Eventually the moons collide, with one more-massive moon emerging after a period during which Earth has a Saturn-like ring. The scenarios also shed new light on the burgeoning search for life on planets orbiting other stars. 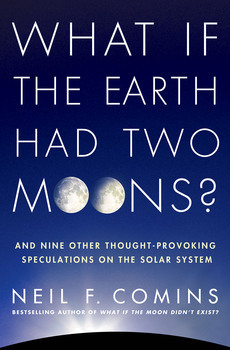 NEIL F. COMINS is a professor of physics and astronomy at the University of Maine and author of popular scientific books, articles and textbooks. An astronomer conjures up stunning new versions of the Earth.